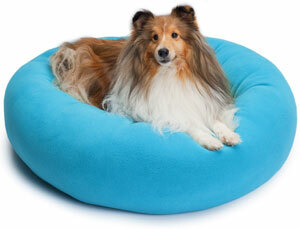 “Imagine sitting on a giant marshmallow!” That’s what it feels like to sit on a Cozy Puff dog bed. Each Cozy Puff dog bed is hand stuffed with so much high-loft polyfill that your precious pet will never feel hard, cold floor surfaces through the bedding. This is especially important for older dogs that may have sensitive, arthritic joints. Ultra-fluffy, cushiony Cozy Puff is ideal for senior dogs, providing the support and warmth that is so comforting. When a pet lies in a Cozy Puff it feels like a soft, warm, comforting hug – an ideal place to curl up and take a cozy nap. Cozy Puff is an original design made of Polartec® fleece and Fairfield Hypoallergenic Polyfill. The bed is two separate parts – the ring, or bolster, and inner pillow. 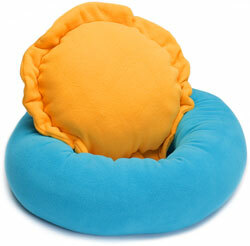 The inner pillow “snugs” into the ring without any type of fastener such as Velcro or zippers. Each part is entirely machine washable, warm, and dryable, delicate. Polartec® is acknowledged to be the highest quality fleece in the world: it retains warmth, wicks away moisture, never pills, and the color remains as bright as the day it was made. Fairfield Polyfill, made from recycled bottle flakes, is a superior polyester fill. It is known for its high loft quality and resistance to clumping. 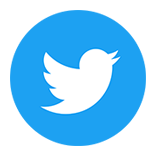 Cozy Puff is a safe, high quality product made 100% in the USA. Cozy Puff Dog Beds donates a portion of every sale to “Operation Baghdad Pups,” sponsored by the SPCA International. U.S. troops in Iraq and Afghanistan befriend local animals as a way to help cope with the emotional hardships they endure every day while deployed in a war zone. 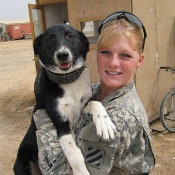 The Operation Baghdad Pups program provides veterinary care and coordinates complicated logistics and transportation requirements in order to reunite these beloved pets with their service men and women back in the U.S. These important animals not only help our heroes in the war zone, but they also help them to readjust to life back home after combat. 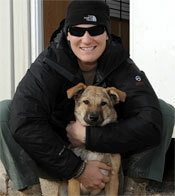 For more information, please visit Operation Baghdad Pups.